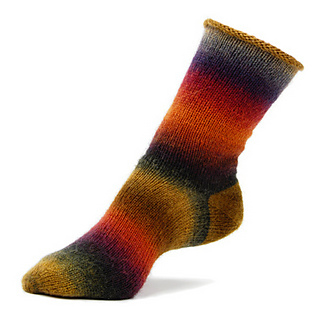 Although every stitch of these socks is knit, they’re called the Purlicue—which is the actual word for the distance between the thumb and the extended forefinger. This handy measurement is a good height for a sock leg! The yarn color changes at the heel because I knit it with the other end of the ball, saving the continuous color pattern for the top of the foot.